This year’s production promises to be the best show performed to date. 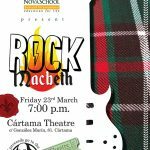 The students of Novaschool Sunland will perform an interpretation of the classic Shakespeare play, “Macbeth”, integrated with rock music from artists such as Queen, Michael Jackson, ACDC, Aretha Franklin, Aerosmith to name just a few! A magical afternoon that cannot be missed. Friday, March 23, at 7:00 p.m. at the Cártama Theatre (c / González Marín, 81, Cártama). Admission costs € 3 and all proceeds will go to the Art Department of Novaschool Sunland International. Do not miss it!